In the Michigan Nature Association family, there is a large pool of achievements. Some of those achievements include publishing books. Whether a compilation of photographs, informational non-fiction or fun children’s stories, our members continue to dedicate their time and knowledge to the education of others. Wild About Michigan Birds, by Adele Porter, is a book that introduces children to both common and at-risk birds in our state. In addition to Michigan, she has books about birds in Minnesota, Wisconsin, and the Northeastern U.S., and recently published Cooking for the Birds, which features 26 recipes that anyone can make to attract different North American bird species. Betty Wilkins, a songwriter, is the author of two children’s books: Mrs. Koops and Behind the Green Fence. 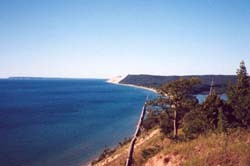 Her song, which she hopes will turn into our state song, is titled, “A Beautiful Peninsula.” The lyrics mention many of the beautiful and historic parts of Michigan. MNA is fortunate to have many talented photographers. Bruce Montagne spent more than 14 years working on the photobook Lake Superior Secrets, visiting almost every part of the lake in every season. Mark Carlson’s favorite place to photograph is in the Upper Peninsula. Michigan Simply Beautiful features his full color photographs from all over the state. Rod Planck published his photo book Nature’s Places, because he wanted people to see what he saw through the viewfinder. Educated as a forester, Charlie Eshbach found professional photography to be a natural fit. 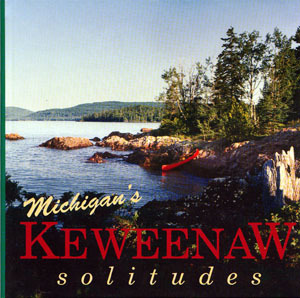 Charlie published Keweenaw Solitudes because, “the Keweenaw is so unusual, I always thought I needed to try and interpret this place with images that were special to me,” he says. Debbie Frontiera captures the emotions of the Italian Hall disaster of 1912 in her novel Living in Sisu, about a young girl who experienced the terrible incident. She wrote the book because growing up in the Upper Peninsula, she thought there should be a story about the incident for children. Cross-country skiing in Michigan was a big deal in 1975, author Dennis Hansen says, but there was not any communication about existing trails. 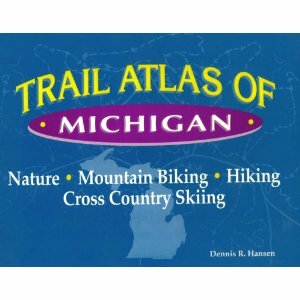 Then he created his book, Trail Atlas of Michigan. The number of trails has grown exponentially and he is having to consolidate his information to can fit it all in. Few realize that Michigan is home to a quite extensive network of gold deposits. Gold in Michigan, by MNA trustee and master geologist Mary Ann Czechowski, discusses mineral gold and highlights locations of gold mines throughout the state. A native of Michigan, Dave Dempsey is a voice for the environment of Michigan. Dave’s most recent book, Great Lakes for Sale: From Whitecaps to Bottlecaps, focuses on the control and ownership of the Great Lakes, and what that means for Michigan’s most valuable resource. We appreciate the dedication of our members, especially those who invest in Michigan through projects, policy, and publication. For more information about these authors or how to purchase their books visit the MNA website. Has anyone from Michigan not used their hand to pinpoint their hometown? This is so normal for any Michigander to do. Using hands as maps is a part of Michigan culture. How exactly are we so lucky to have our state shaped like a mitten? If you were thinking glaciers, you’re absolutely right. MNA trustee and geologist Mary Ann Czechowski shed some light on Michigan’s glacial history in a recent interview. Mary Ann is a geology consultant and the author of Gold in Michigan. 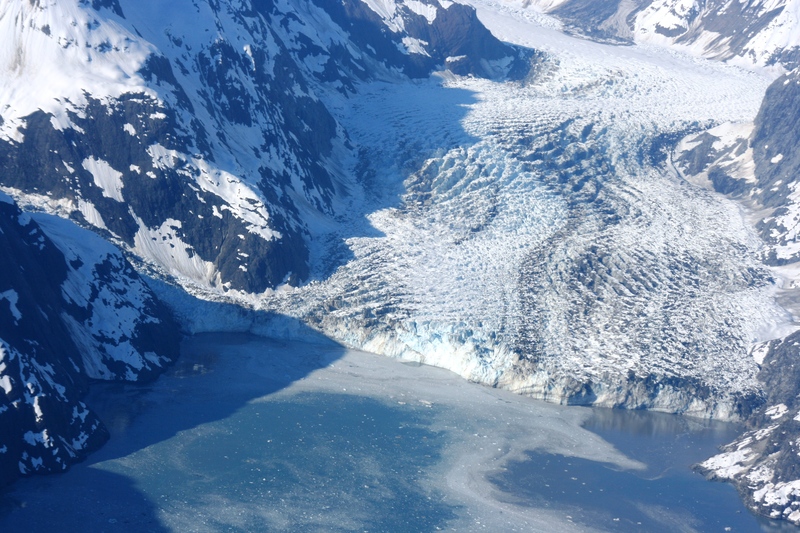 A glacier is essentially a large river of ice that flows through a landscape. Today, glaciers can be found on every continent except Australia. There have been four Ice Ages in the Earth’s history. In the last Ice Age, the Pleistocene Epoch began and lasted from approximately two million years to 12,000 years ago. During this time, warm and cool temperatures alternated and glaciers retreated and advanced in interglacial periods. Around the world, glaciers carved and influenced much of today’s landscape, including the Great Lakes and the state of Michigan. Like bodies of water, the first glaciers flowed south from what is now Canada seeking the areas of least resistance. It is believed that the Great Lakes were once ancient riverbeds, providing the glaciers perfect pathways south. With each advance and retreat of the glaciers, the shape and water level of the lakes changed. These changes weren’t happening in a matter of months, but over thousands of years. Manistique Dune and Swale Nature Sanctuary with prehistoric beaches. Photo: Keith Sayor. As the shape and water level of the lakes changed, the beaches did as well. When water from the glaciers retreated, it left behind a beach. The Manistique Dune and Swale Nature Sanctuary, recently visited on MNA’s fall adventure, has excellent evidence of these prehistoric beaches. In the sanctuary, a swell of sand will appear out of place among the trees but as you continue to walk towards the current water’s edge, you will walk through various sand swells among trees representing past water levels of Lake Michigan. Evidence of glacial beaches can also be found at Frink’s Pond and Carl E. McAlvay Memorial Plant Preserves. See the MNA’s sanctuary page for more information on these sanctuaries and others throughout the state. Many of Michigan’s inland lakes, including Walled Lake and Higgins Lake, were also formed by glaciers. These lakes are called kettle lakes, and were created when chunks of ice would break off the glacier and become embedded in the ground. When the ice chunk would melt, a kettle hole would be left and be filled by water from natural sources. Goose Creek Crasslands Prairie Nature Sanctuary. Photo: Matt Schultz. As the glaciers carved the landscape, they left deposits of sediment. Small pieces of rock originally from Canada have been found as far south as in Indiana and Ohio. Here in Michigan the Goose Creek Grasslands Prairie Nature Sanctuary rests in a glacial trough where raw gravel was left by retreating glaciers. 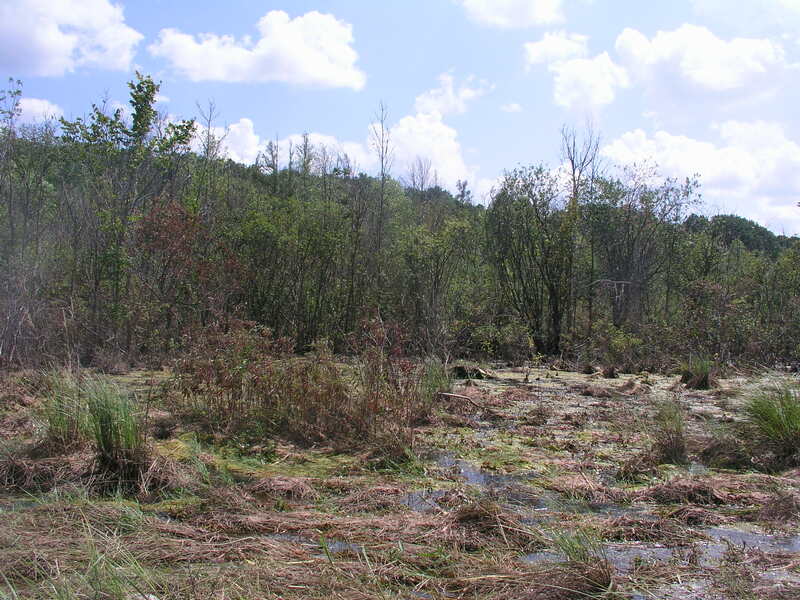 Timberland Swamp Sanctuary is a basin that was formed by debris left by the glacier. Saginaw Wetland Nature Sanctuary. Photo: Meghan Good. Michigan sits atop bedrock composed of many rock types, including sandstone. As the glaciers eroded the landscape of Michigan, sand became much more prevalent, giving us our sandy beaches, sand dunes and wetlands. The sand blocks the drain of water from land into the lakes, and trapped water creates wetlands, such as the Saginaw Wetland Nature Sanctuary in Huron County. The sand eroded by the glaciers has also shaped Michigan’s shorelines today. Michigan receives mainly westerly winds, causing the Lake Michigan coastline to have significant dunes not only along the shoreline, but also further inland than usual. For more information volunteering or visiting sanctuaries, please visit the MNA website . Special thanks to our members for their support and help throughout Michigan. This past spring, it came to the attention of MNA that the new resident beavers of the Edwin and Margarita Palmer Memorial Sanctuary in Kalamazoo County were causing quite a problem. The sanctuary includes a prairie fen which is threatened due to the beavers. 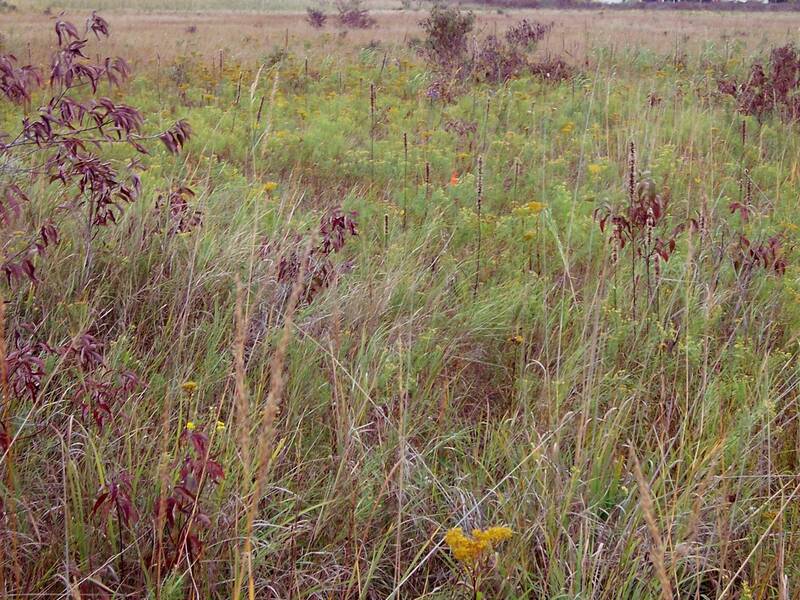 Prairie fens are rare plant communities declining across the landscape. 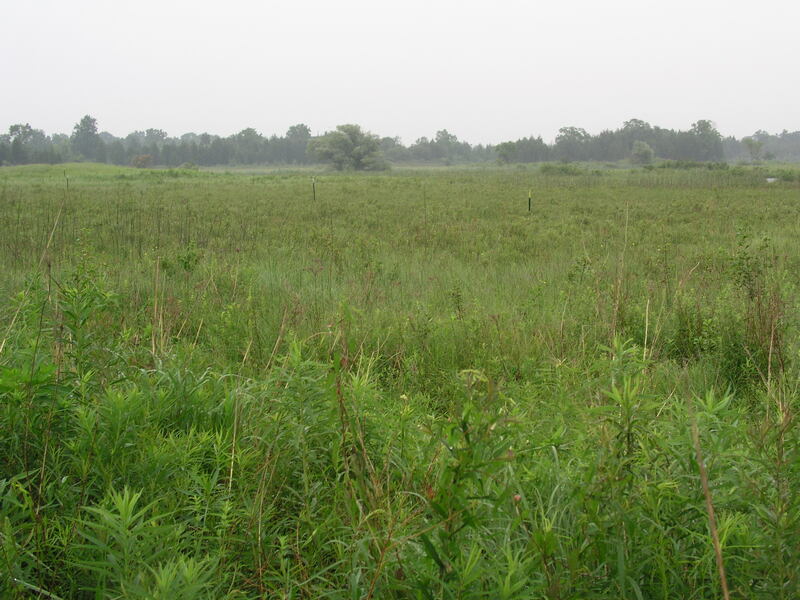 Unlike pre-settlement times, southeast Michigan only has about 5,000 acres of prairie fen remaining today. Fens are a type of wetland high in calcium and magnesium due to the fact that it is alkaline and fed by groundwater that picks up the elements via limestone. They are lower, however, in levels of nitrogen and phosphorus which leads to more evolved mechanisms in plants, such as the carnivorous sundew and pitcher plant which obtain their nutrients from insects. Fens are also botanically diverse due to presence of a wide array of microhabitats. For plant life to survive in fens, they require very specific water and nutrient levels which the beaver dam was disrupting. 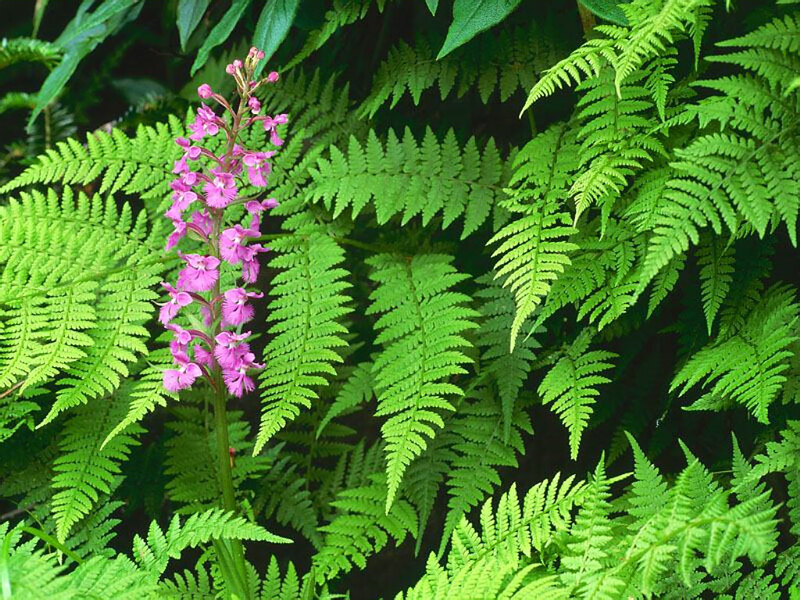 Some but not all of the rare plants species that are under threat include the prairie Indian plantain, tussock sedge, purple fringe orchid, and sundew; all which have specific water requirements to flourish. The prairie indian plantain is not a particularly showy flower but its size is striking. With small flower heads and little noticeable scent, the plant is unique in shape and is an indicator of a high quality habitat. The plantain’s blooming period lasts about a month in early to mid summer and in the State of Michigan is listed as a species of special concern, which doesn’t grant them legal protection, it is carefully monitored because of its declining population in the state. 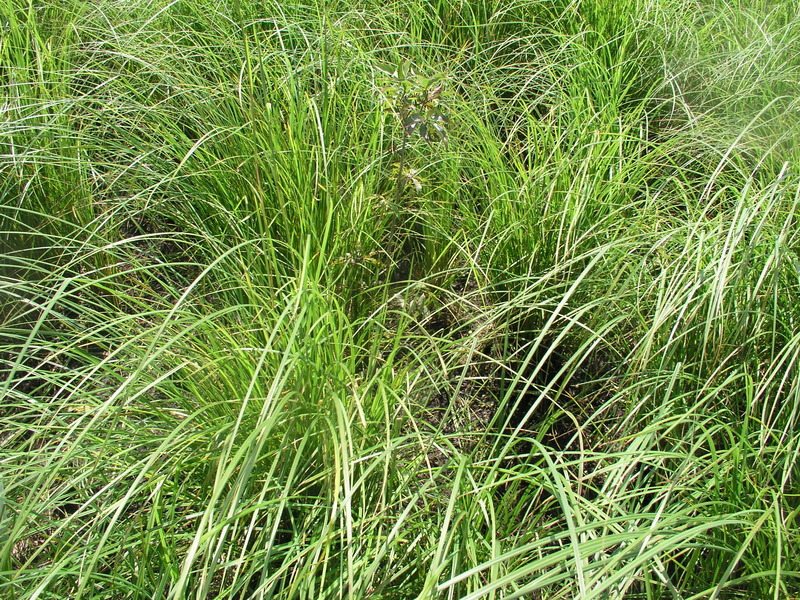 Tussock sedge is a grass like plant that grows at or above water level. A good example of a microhabitat, the sedge’s hummock base acts as a wetland but the top of the hummock is more upland, leading different plants to grow at different places within each hummock. Typically growing in clumps of two feet by two feet, the sedge is a food source for a variety of animals including ducks, turkeys, deer, and our resident beavers. The sedge is also a great nesting site for birds. The purple fringed orchid is a tall one to two foot orchid blooming in July and August. The orchid is attractive to bees, butterflies, and birds and can grow anywhere from six to eighteen inches tall. 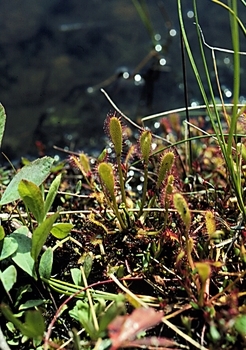 The sundew plant is carnivorous. That alone should make it worth saving. On its leaves, a gel like substance is on the end of tendrils, appearing like morning dew all day long. In the sun especially, the glistening gel draws in insects for the plant to eat. Sundew is also listed in the state of Michigan as a special concern. The beaver dam was blocking the drain of water from the prairie fen thus raising the water level to dangerous heights: 2 ½ to 3 feet above normal. For array of rare and unique plant species, including the ones listed above, an increase in water level could be detrimental. 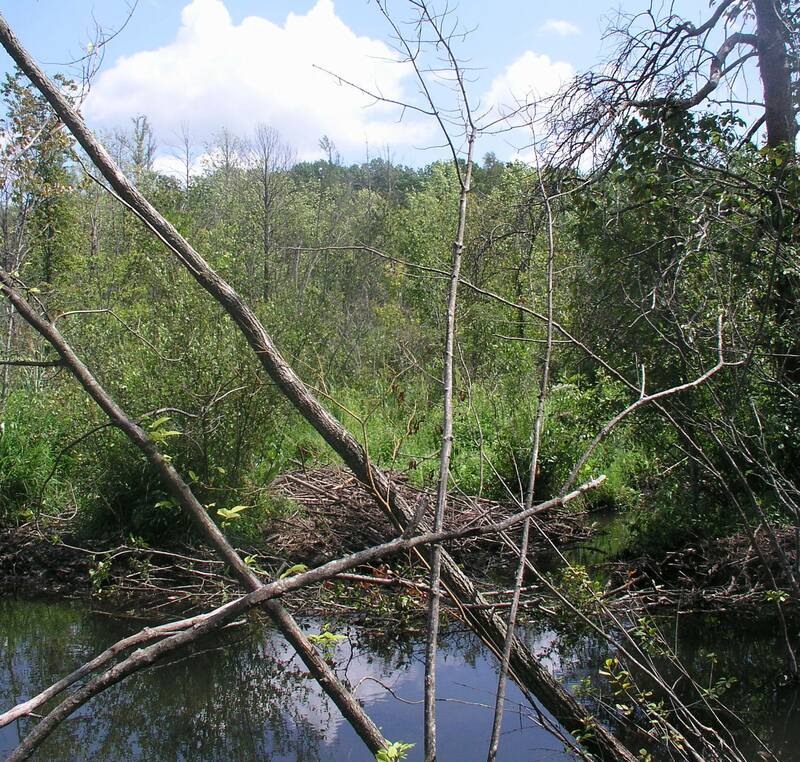 MNA has many beaver dams in many properties around the state but none have ever caused such a severe problem to a habitat. Initially, Andy Bacon, MNA Stewardship Coordinator and Matt Schultz, MNA Western Regional Stewardship Organizer, with the help of volunteers tried punching holes in the beaver dam to help drain the water from the flooding fen. However, within 2 days, each hole was plugged by the beaver because “they don’t have anything else better to do,” said Andy. More drastic measures needed to be taken to protect the prairie fen and its inhabitants. 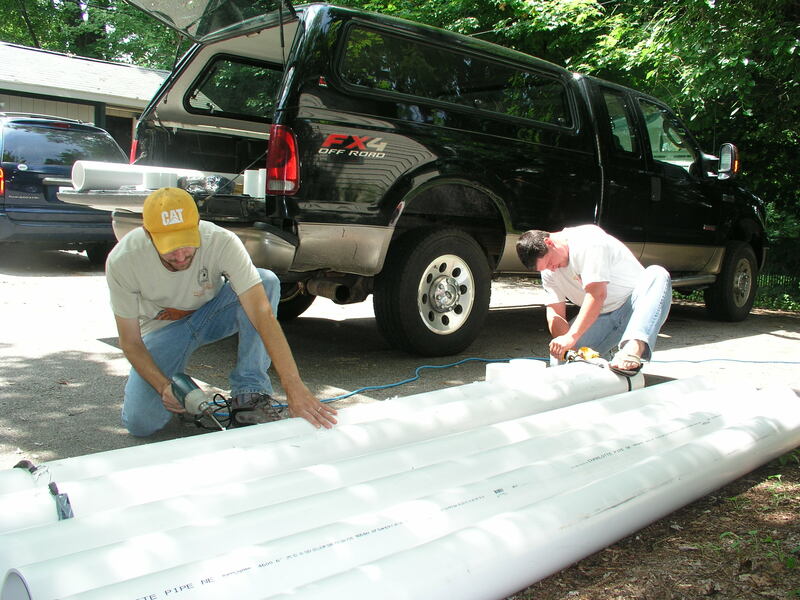 Matt and Andy then worked to construct a beaver pond leveler. 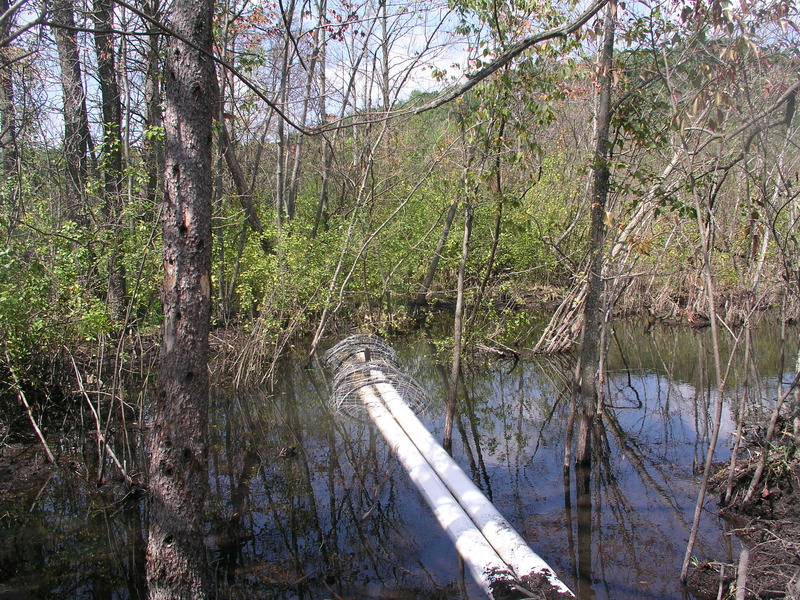 With the leveler, water from the flooded area is drained through a hole-drilled PVC pipe and carried through the beaver dam and out to the draining area. Around the hole-drilled end is a wire cage to block debris such as leaves and twigs from blocking the individual holes which drains the water. On the day of installation this past August, Matt and Andy with the help of MNA volunteer steward Charles Goodrich canoed the leveler to the fen in pieces up the creek and to the flooded fen where it was constructed and installed past the beaver dam. In order to fool the beavers, in addition to punching the necessary hole for the leveler, the guys also punched two additional holes in the dam so the beavers would repair the ‘fake’ holes and not the one being used by the PVC pipe. Initially, the leveler was believed to have been a success by lowering the water level back to the it’s original state before the beavers arrived. However, after some time in the environment the water level is now 6 to 12 inches above the original level again. Some steps are being taken to investigate and solve the water level problem. 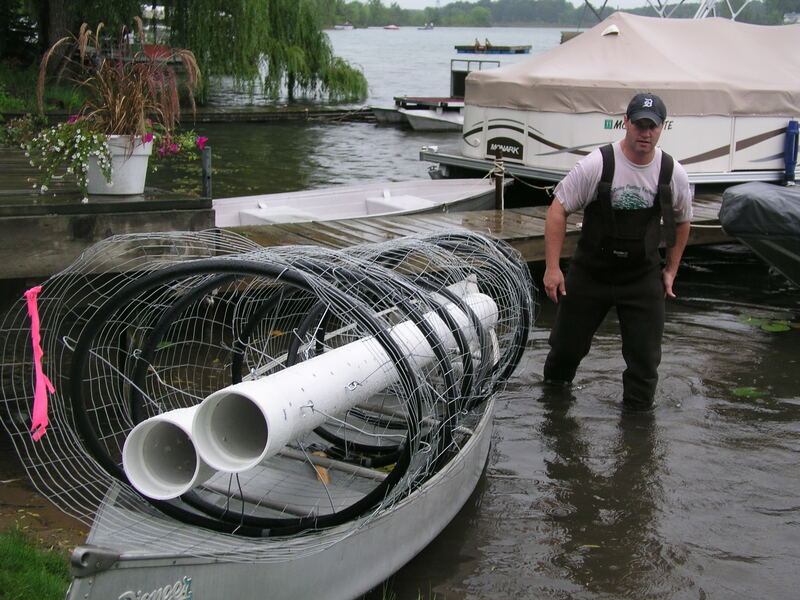 Schultz believes that the mesh cage of the leveler may be sticking too high out of the water causing the entire leveler to not drain properly. One idea is to push or sink the leveler further into the water for better drainage of the flooded fen. Overall progress has been made. When the beavers leave and abandon their dam in the future, the leveler will be removed. 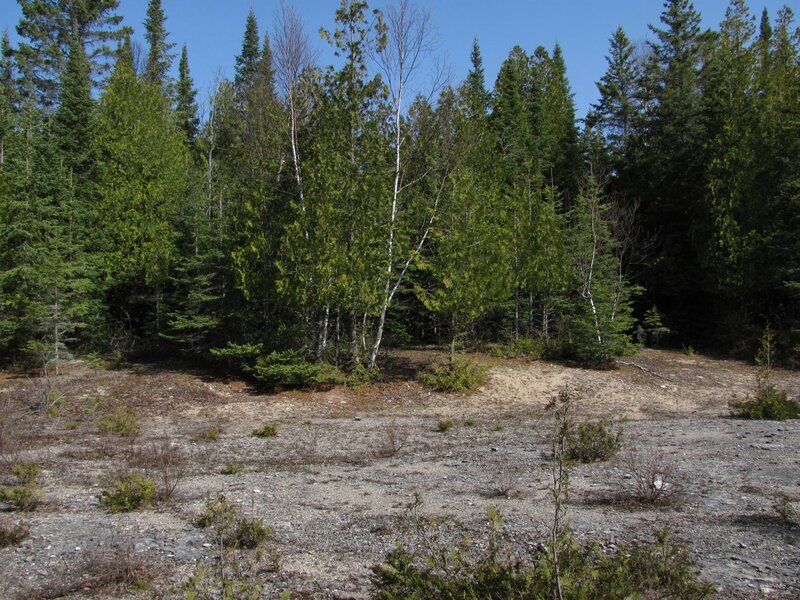 MNA would like to thank their members for making projects such as these possible to save such valuable sites such as the prairie fen in Edwin and Margarita Palmer Memorial Sanctuary.